Home / Adviart Blog / Structure supports true self. 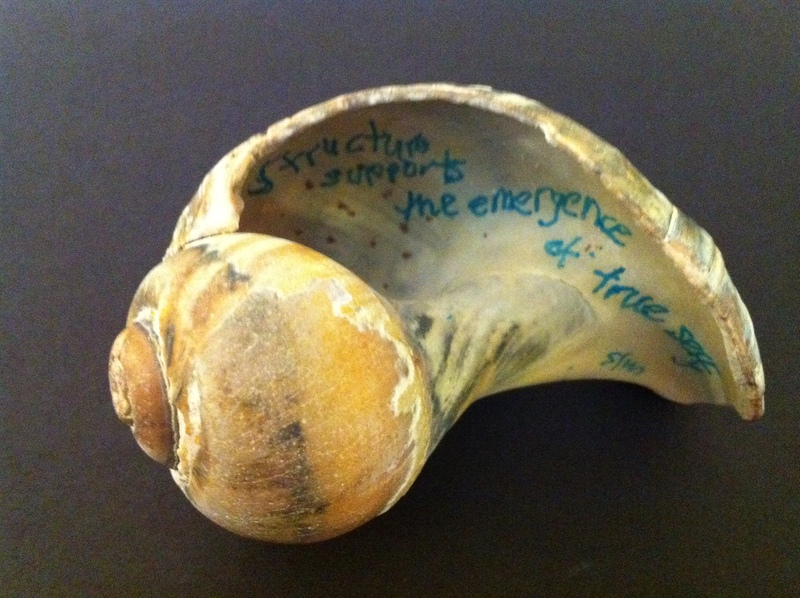 Structure supports the emergence of true self. The shell was picked because of the pronounced circular growing nature–starting at a central core and fanning out–expanding as the structure fans out allows true self to emerge. The color was picked because the adviarter thought about my perspective. She was one of the only ones to date who has consciously noted a focus of the need for advice that focuses on the other party instead of self. The design of the shell was thought out over time–the conversation quite deep and longer than most that have taken place over the adviart process. So what is structure? Structure allows for a process to be in place that can allow one to excel. While I think structure is important–I see structure in this context as structure of life. By structuring priorities and the way in which one exerts his or her energy, true self can come to fruition because it enables one to follow his or her own happiness. Structure also allows each person to be able to make judgment calls on how to get the most return out of an organization and a personal life. The question is, how do you keep structure yet evolve it at the same time?